After real American breakfast of bacon & eggs and American coffee, walked to Piazza di Spagna via the Spanish Steps to American Express. Had 2 letters from Daddy* and one from Fred. ** Went shopping and bought 3 silk ties. *** Lunched at American Bar -- had hamburgers, a coke, and apple pie a la mode. Went on tour of city in afternoon. Saw St. Mary Major church (beautiful chapel of Borghese), ancient Roman ruins -- supposed chapel of Quo Vadis, the catacombs (very impressive, even saw some with bones still in graves), drove along the Appian Way (just exactly like I pictured it would be) -- the Sacred Stairs (people can walk up them but only on their knees) and the [Arch]Basilica of St. John Lateran (the cathedral of Rome where the Pope is the bishop). Went back to tie shop after tour and bought more ties. *** Ate supper in Railroad Station restaurant. 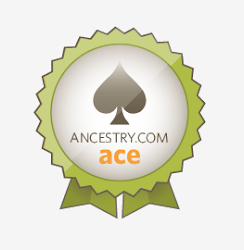 * "Daddy" is my maternal grandfather, Charles Peter Guokas Jr.
** "Fred" is my father, Frederick Henry Pape - he and Mom were dating at this time. *** According to the "PURCHASES" section of the trip diary, my mother purchased a total of seven silk ties at Son Man Arbiter in Rome for a total of 126 lire. Once again, way more beautiful and interesting sights seen this day than I can possibly post pictures of! 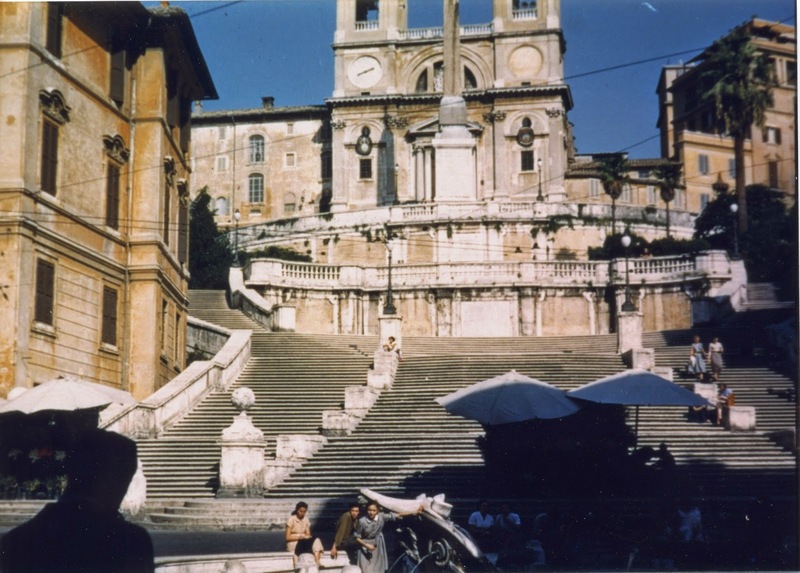 I've included the one Mom took of the Spanish steps, one of the Borghese Chapel she commented on, and a number from the Appian Way and sites along it that she mentioned or might have seen, with many of those photos from 1961. The 135 Spanish Steps, built in 1723-1725, lead from the Piazza di Spagna to the 16h-century Trinità dei Monti church at the top, part of which is visible in Mom's photo above. Mom mentioned watching the movie Roman Holiday on the ship on the way to Europe, and it has a famous scene filmed here. 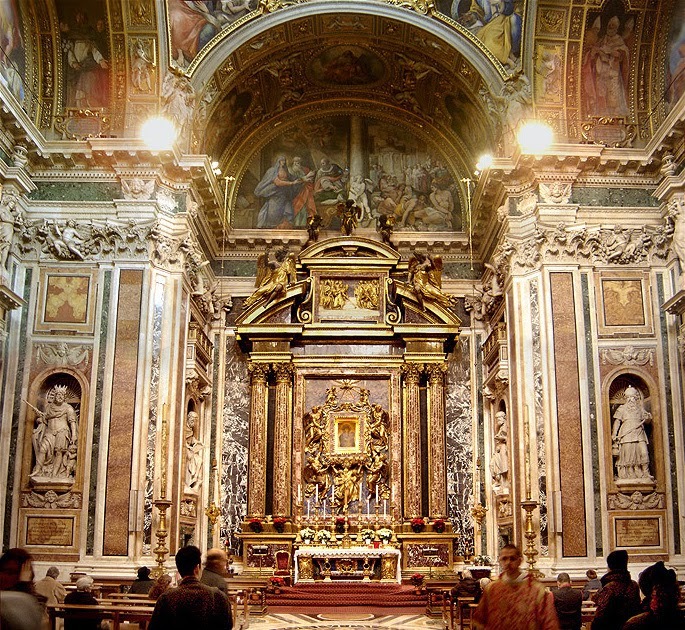 The Borghese Chapel of the Basilica di Santa Maria Maggiore, pictured below, houses the Salus Populi Romani, a famous icon of the Virgin Mary and baby Christ Jesus. 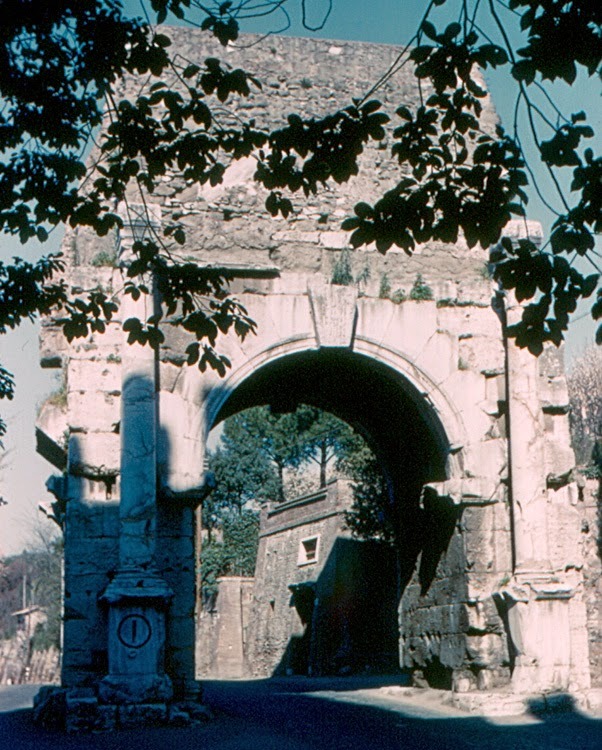 The Arch of Drusus (pictured above) is near the beginning of the old Appian Way (Via Appia Antica), next to the Porta San Sebastiano, which is one of the gates in the Aurelian Walls in Rome. 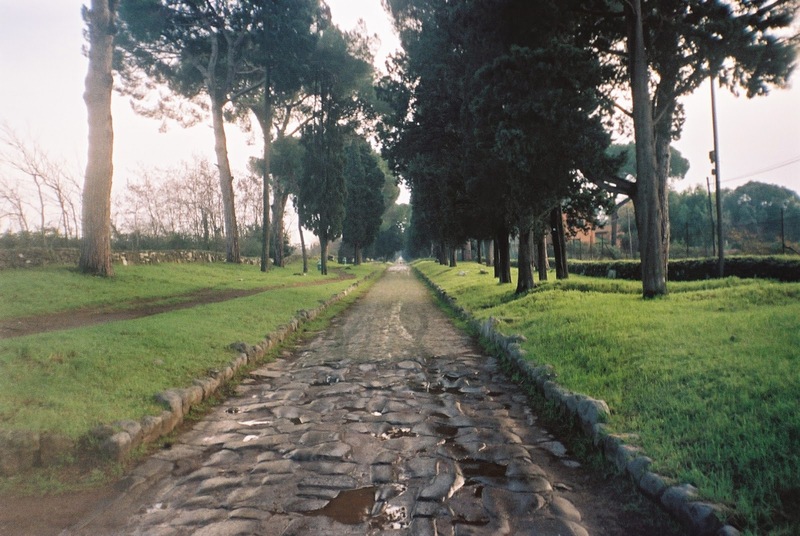 The photo below was likely taken just past this gate, in the first mile of the Via Appia Antica. The Arch was built of marble sometime prior to 211 A.D. and later had a now-brick-faced aqueduct added to the top. 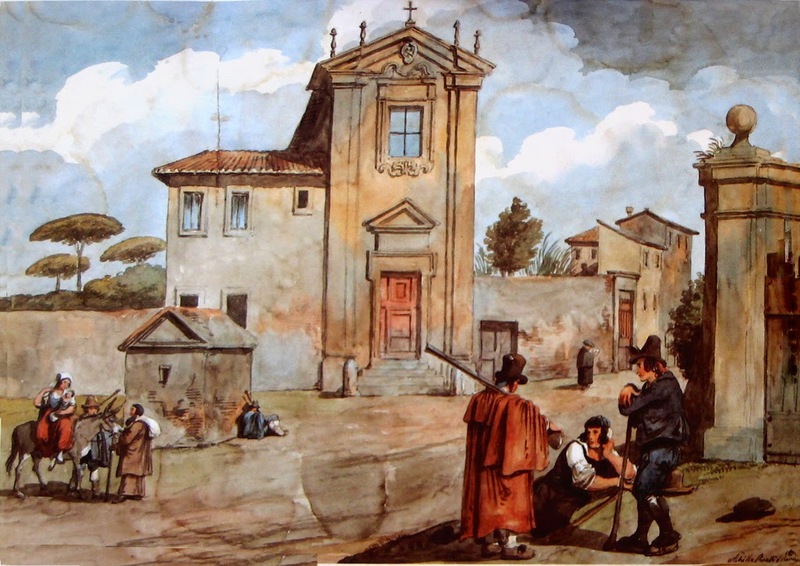 The Church of Domine Quo Vadis, dating from 1637, is in the second mile of the Via Appia Antica. The church is really named Chiesa di Santa Maria delle Piante, but its common name comes from the legend that St. Peter, while fleeing persecution in Rome, encountered an apparition of Jesus and asked (in Latin), Domine, quo vadis? which means, "Lord, where are you going?" I liked the watercolor above, painted between 1826 and 1835, better than any copyright-friendly image I could find online. 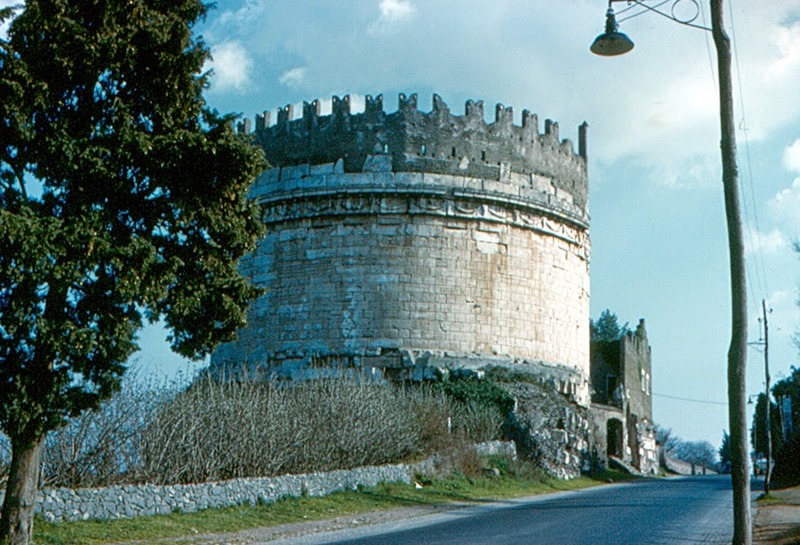 The Tomb of Caecilia Metella (pictured below) is one of the few remaining Roman monuments on the Via Appia Antica. It was built in the first century B.C. She was a patrician woman who was the daughter of one Roman Consul, mother of another, and married to a son of Crassus, one of the (first) triumvirs with Caesar and Pompey. 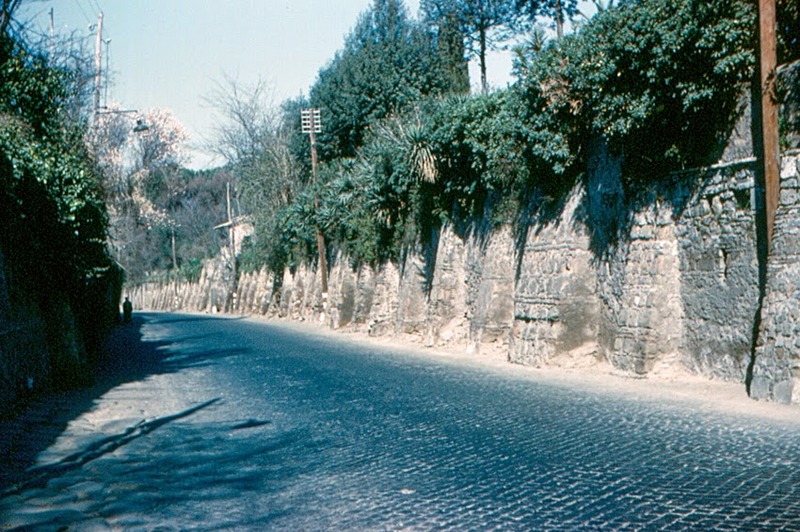 The section of the Via Appia Antica pictured below may have some of the original paving stones. This is the 53rd in a series of posts transcribing entries in my mother's 1953 Europe Trip journal.